If a contact is given the tag "Customer service follow-up," a follow-up email is sent after one day. If the customer clicks the "not resolved" link, it will tell your support team to reach out to them, and redirect the contact to a form to collect more information. If they click the "resolved" link, it will remove the tag. 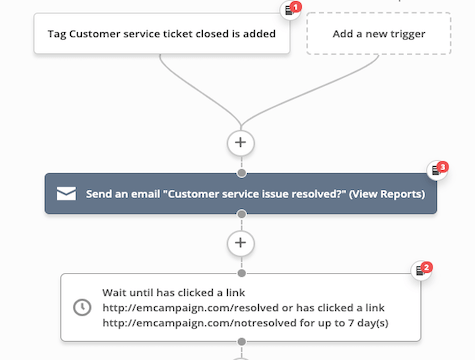 You could apply the "Customer service follow-up" tag with Zapier by integrating with your help desk app.